The recent leak regarding AMD's all new tablets known as Project Discovery is proving to be quite interesting. It appears that AMD are entering a new series of tablets to the technology market with increased processing power and battery life, not only are we going to see new tablets but we will get a range of new peripherals too. Project Discovery covers many features from what you would get with mobile devices and desktop PCs, and this is done through the peripherals offered, one of which being a game pad and the other a docking station. The game pad peripheral offers integrated stereo speakers as well as a standard controller layout many of us are familiar with, the docking station however offers much more. 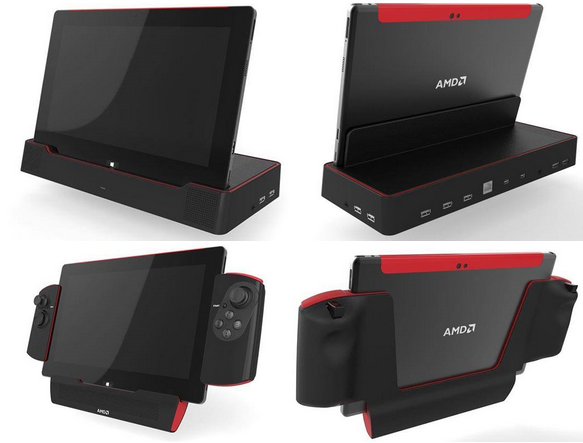 From the images you can clearly see that the docking station offers more USB ports, can be hooked up to multiple displays, and a networking port as well as built in audio and possible external audio solutions, all of which is gained through AMD's DockPort technology. We don't have any specs just yet but we have some images, possibly concept designs but I am sure we will see more at CES 2014 which kicks off on January 7th 2014.